The S650 and T650 M-Series models feature improved visibility and a more spacious and comfortable cab. The S650 has a rated-operating capacity (ROC) of 2,690 pounds and an operating weight of 8,327 pounds. 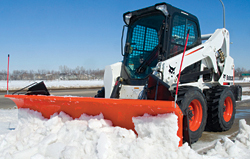 The T650 has a ROC of 2,570 pounds and an operating weight of 9,440 pounds. Both the S650 and T650 feature a vertical-lift-path design, a 74-horsepower engine, and a standard hydraulic flow of 23 gallons per minute. The maximum travel speed for the S650 is 12.3 mph, while the maximum speed for the T650 is 6.6 mph.